It is 1975, and at the Park Senior High School (as bog standard a comprehensive as they came) a group of curious schoolboys led by a farsighted maths teacher take the bus into Swindon town centre and enter the headquarters of the Nationwide Building Society. There, we potter down to the computer room where we are allowed access to their mainframe (a UNIVAC 1109 with drum storage, if my memory serves) because they didn’t use it in the evening. I will never forget that kindness from Nationwide and they still have place in my heart for it today. It was there we worked on our first serious programming project, a system to schedule appointments for the parent’s evenings! Can you imagine ringing up, say, Barclays Bank today and asking them if some school kids could use their mainframe in the evening if they’re not too busy? Astonishing. Other weeks we took the bus up to the now-demolished Swindon College, where we used their Elliott 803B with a then-amazing 8Kb of core memory (you tell the kids of today that…) to write Algol programmes on 5-track paper tape. You loaded the compiler, the loaded your program and the machine produced a machine code tape (for their strange 39-bit word instruction set) and then loaded your machine code and executed. Here’s a video of someone using one of these beasts! I don’t remember much about what software we wrote, although I do remember spending an inordinate amount of time working on my football simulation that used random numbers to work out where the ball went after each kick. 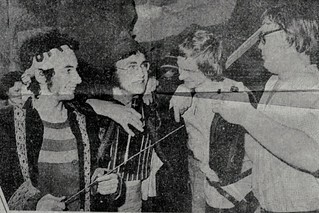 Park School 1976: Me, Clive Debenham (Rest in Peace), Simon Turpin and Bob Kirby (Rest in Peace). In the hot summer of 1976, we were also allowed, and I have no memory of how this came about, to cycle out to the Royal Military College of Science in Shrivenham and use their more advanced computer system — although I can’t remember what this was — to write in Algol 68-R. In those pre-Al Qaeda days, we were allowed to amble around the campus and wander in and out of the computer room essentially unfettered. This all stood me in good stead. When I got my first vacation job at college it was for the Southern Water Authority in Eastleigh. One day my boss asked me if I could help him with a problem. The IT department (in Brighton) were sending him the wrong statistics. Did I know anything about computers? We opened the cupboard at the end of the corridor and found a teletype connected to a 1900-series (a 1906?) running Fortran under GEORGE III, which fortunately I knew how to use. I was instantly appointed departmental IT supremo, and never looked back! Demystifying Communications Risk: A guide to revenue risk management in the communications sector. In telecommunications, just as in banking and retailing and most other businesses as far as I can tell, fraud is an ever present cost of staying in business and managing that fraud down to acceptable levels is one of the most important roles of operational management. That’s easy to say, but hard to execute. I picked up Mark Johnson’s “Demystifying Communications Risk” (recently published by our friends at Gower) by Mark Johnson from The Risk Management Group hoping for a few ideas on this front and I wasn’t disappointed. I’m not an expert on the operational management side of telecommuncations, but I think for someone entering the field Mark’s layout, examples and checklists combine to make the book a very useful starting point. The overall message of the book, for me, was (as always) isn’t hackers who are the problem, but the staff. Here I found Chapter Four the most relevant. It is fascinating discussion on managing insider fraud, written by Nick Mann of Nick Mann Associates, which shows just how hard this is, partly because of the variety of the frauds and partly because of the statistics. Basically, most employees are potential fraudsters! He gives a case study of an internal fraud that was uncovered after $6 million in losses, yet not a penny was recovered., highlight the point that prevention is better than cure. Actually, I thought Michael’s use of specific case studies was very helpful throughout the book and in some cases very surprising (for example, the clock drift on a switch leading to incorrect rating). I found his discussion of prepaid frauds especially interesting, partly because they are so simple and partly because I think the growth in prepaid will continue over the coming years. I rather liked Michael suggestion of a risk management “dashboard” of relevant key performance indicators. We do a lot of risk management work in the digital money and digital identity fields, and help clients to devise and implement appropriate countermeasures, and I will be certainly using the dashboard idea in the future. Mark covers many of the areas that will be familiar to risk management practitioners including computer and communications security, countermeasure return on investment and revenue assurance control points but he also introduces management techniques that strike me as being pretty helpful to newcomers (looking at risk strategy as the interconnection between risk management cycles, for example). I think he will open many people’s eyes to some wholly new categories of risk that will need managing in the modern communications service provider. He gives over a whole chapter to the specific headache of dealing with anti-money-laundering and anti corruption controls that are unfortunately part of the customer billing and management world now: a very valuable summary. All in all, this book distills a great many years of practical experience in a presentable and practical form and is sure to be useful to those entering the realm of revenue management. US cashless backlash: why punish retailers? 15Mb™ is a registered trademark of dgwbirch limited, no. UK00003260485.